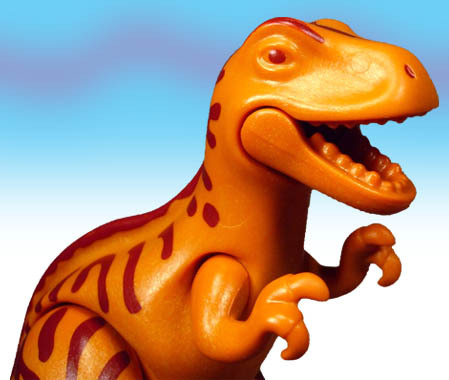 One of six sets in Playmobil's inaugural Dinosaur collection, the Dino Discovery Team set (known as Dinosaur Discovery in the specialty market) included one of only two full-size dinosaurs to be issued in the series. While the item retailed for $19.99 and up, we found ours on clearance at Toys "R" Us for $4.98 in 2006. 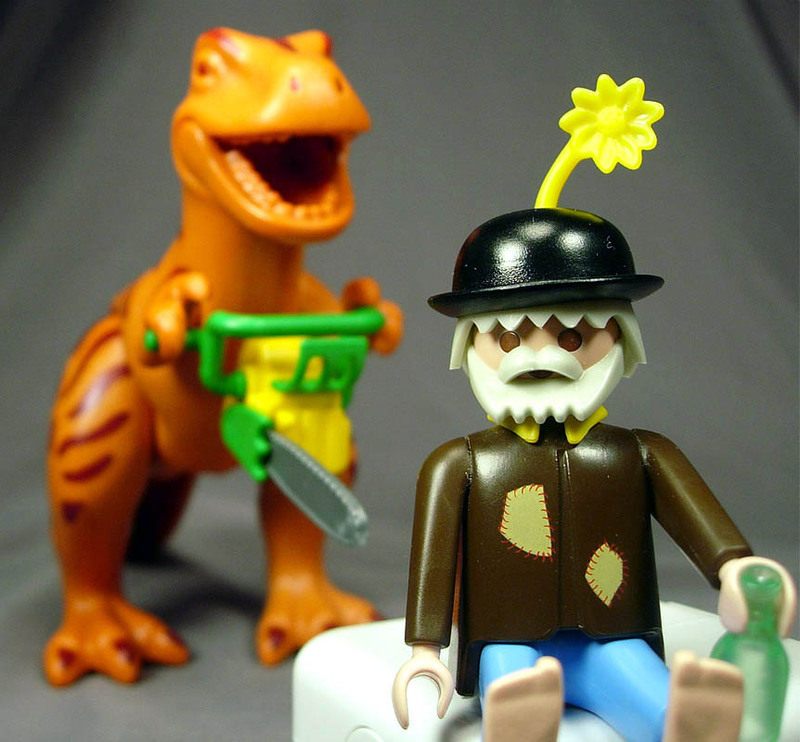 Thousands of years (or days) ago, Hans Beck-- the creator of Playmobil-- once said that dinosaurs would likely never be made for this line. (Or so says Collectobil.) One of the reasons we've heard for this in other interviews had to do with the human-dinosaur interaction being impossible in the realm of the toy line, but obviously, anything can happen when you put two toys in the same box. Originally sold in 2004, this set has since been retired. It was sold on the US mass market for roughly a year before getting dumped unceremoniously to the clearance racks. 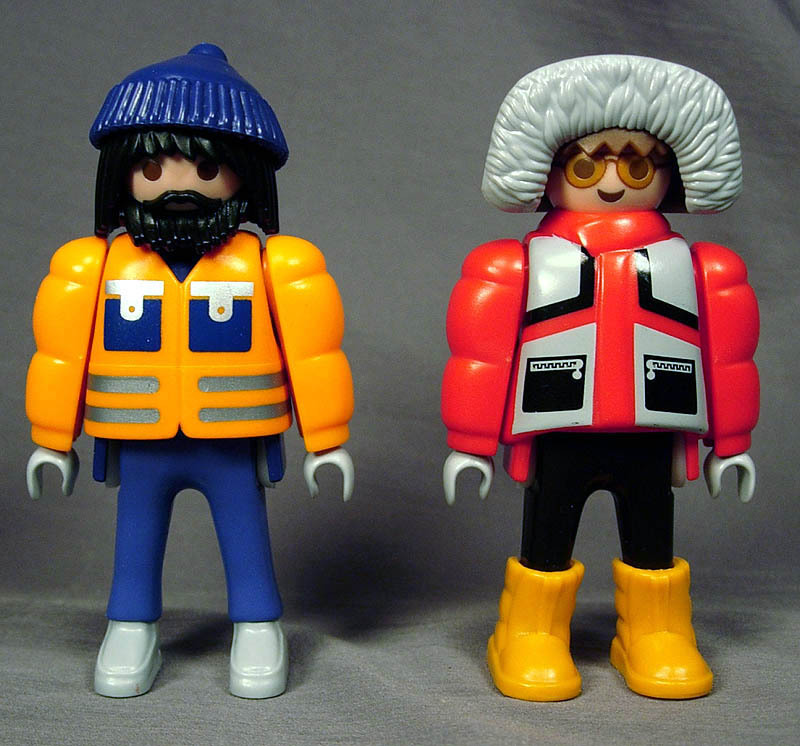 Playmobil figures have seen very few minor changes in the actual body construction since 1974, and these figures hold true to the original design, with some added pieces to represent big puffy coats. Now kids have the chance to yell at their toys and demand they wear a jacket before going out, so it's like getting a decade or more head start on parenting. 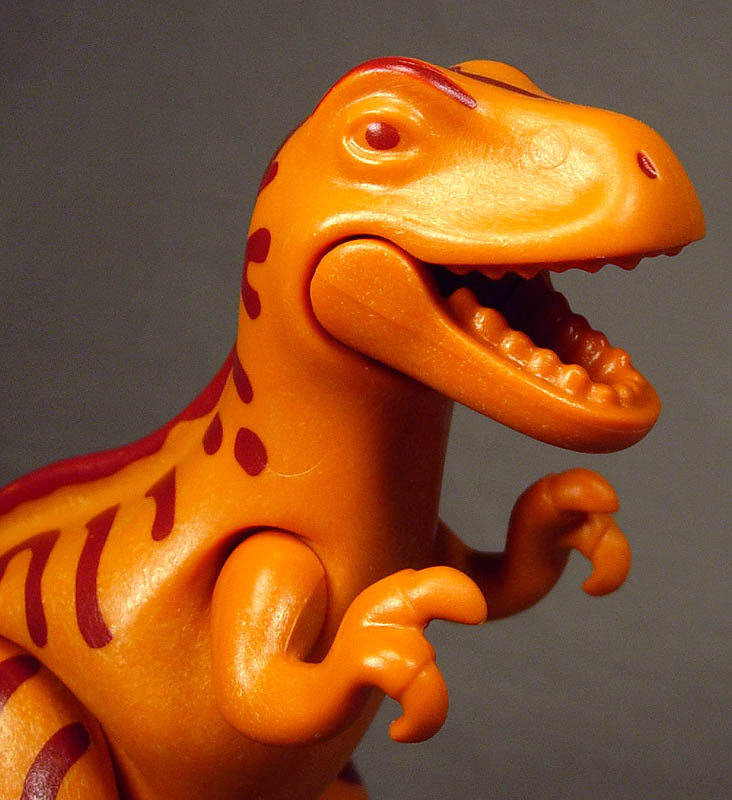 There's a valuable educational skill right there, nag education through plastic dinosaurs. 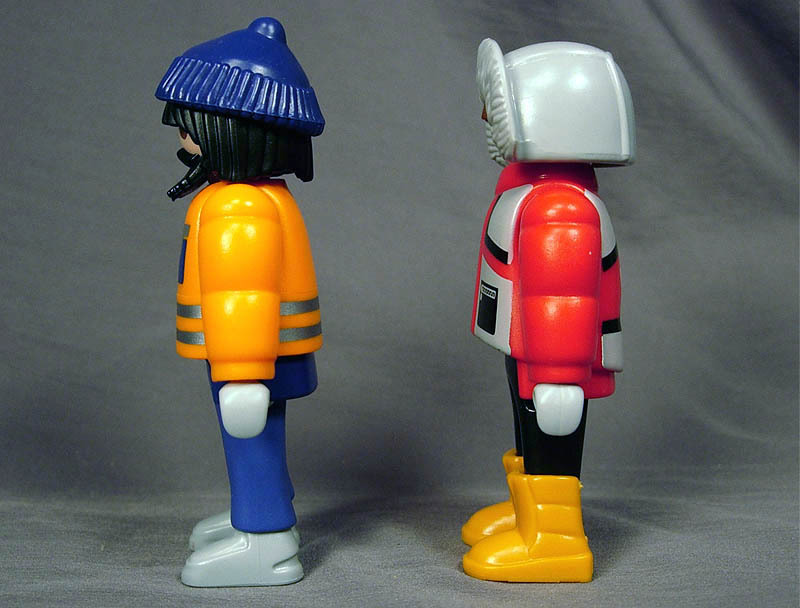 The orange figure (left) has molded boot legs plus orange molded pieces over a blue body with orange arms to represent the jacket. The arm pieces are completely removable, however you won't get the jacket's body piece off without removing the head. Without the puffy arms, he looks less like an explorer and more like someone who's going to fill your potholes. If you pop off the orange figure's hair, you can also remove his facial hair. 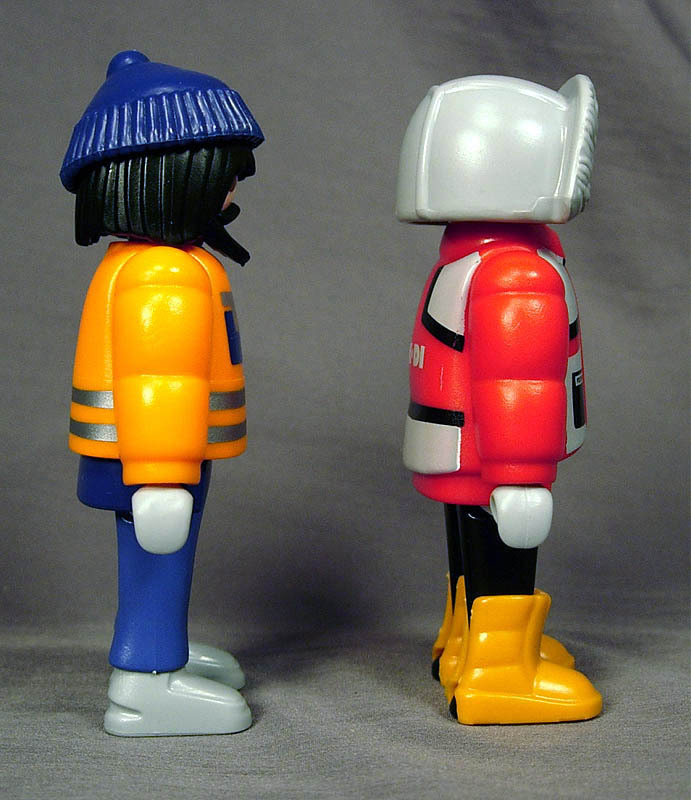 The red figure (right) is very much like the orange, except his boots are removable pieces which cover a pair of otherwise drab feet. As an added bonus, the figure also has glasses painted on his head. The hats on both figures are easily removed. Both figures have a fair amount of printed deco on their jackets which does a lot to add character to their outfits. 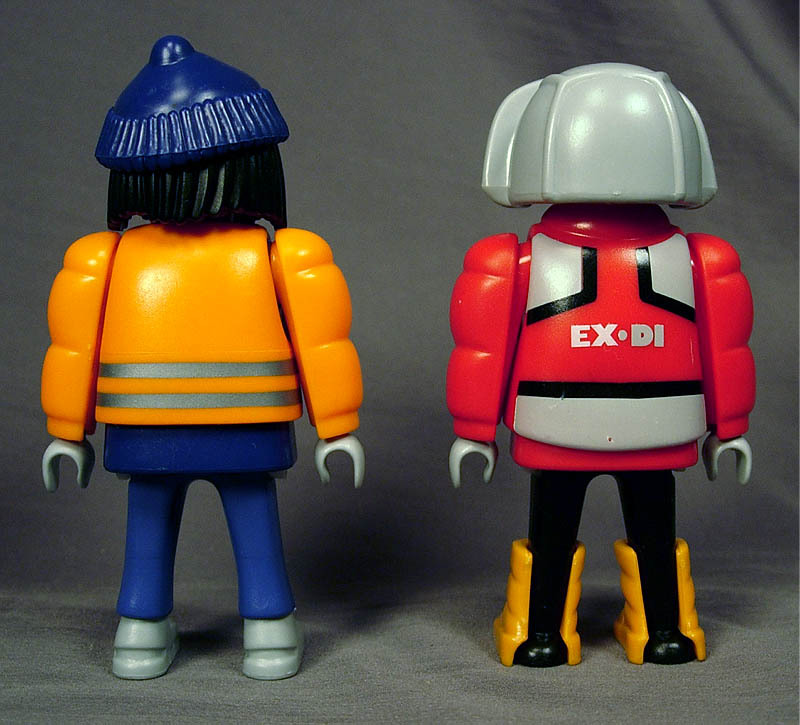 The red figure features the "EX-DI" logo found on the bulk of the sets in this range, and you'll note it again in this set on a flag. 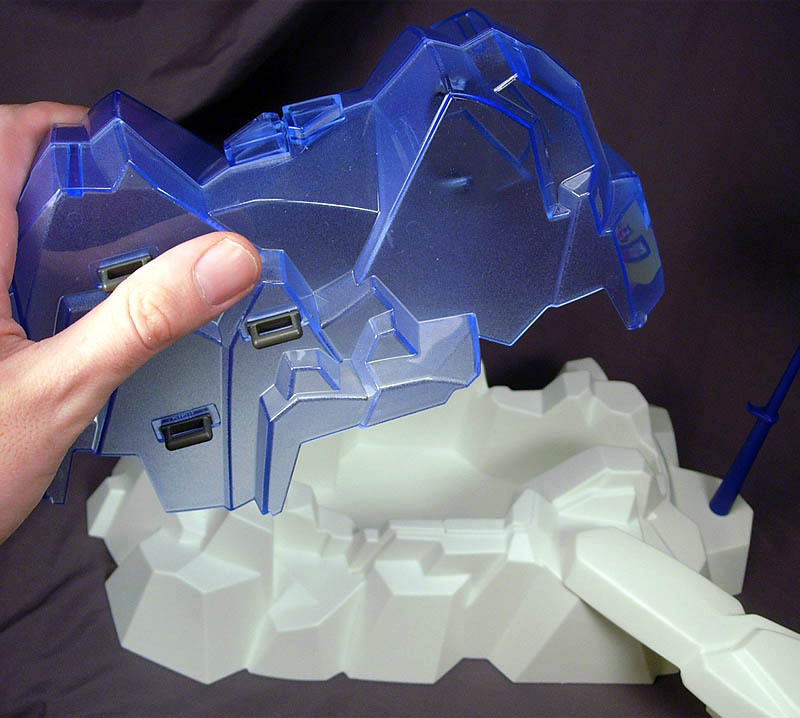 It's also prominent on the hardware and vehicles in the other sets of this collection. We've found the design to be good, but not great. Many Playmobil creatures tend to have little to no paint on them, and the various coloring and textures on the item are a result of ingenious design allowing for multiple pieces to fit together in such a way where paint is not required. I saw mine get some minor scrapes when it was stored in its box and left alone for a while, so the construction isn't what I would call great. 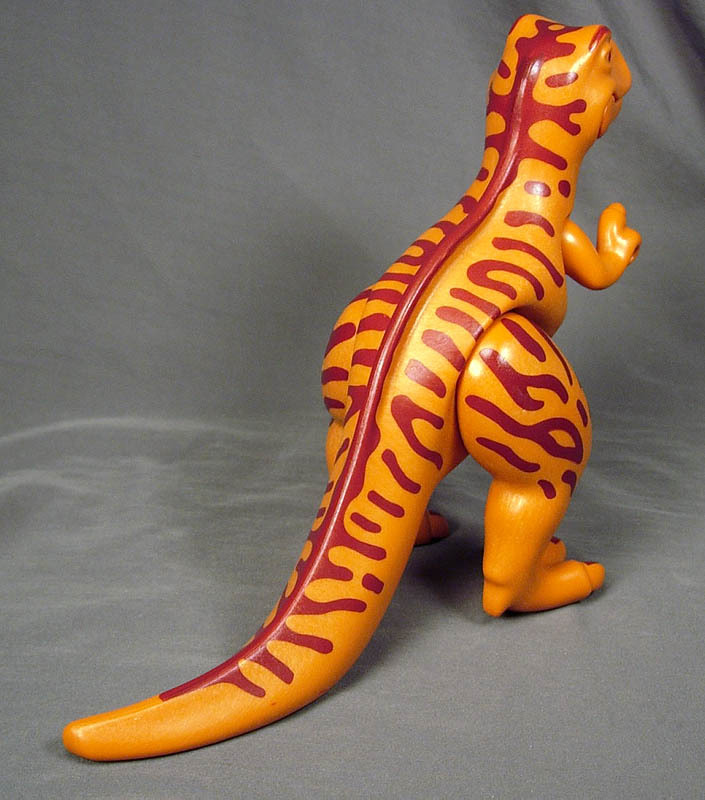 The sculpt holds true to early Playmobil animals in that it's not overly complicated-- this is both good and bad. It fits in well with the simple style of other Playmobil creatures, but this also means that elements such as white teeth and painted claws were left out. There's room for improvement if Playmobil ever decides to reissue the creature, but overall it works nicely for what it aspires to be. And yes, we do feel weird judging these toys for grade schoolers on the same kind of level we apply to high-end collectibles. 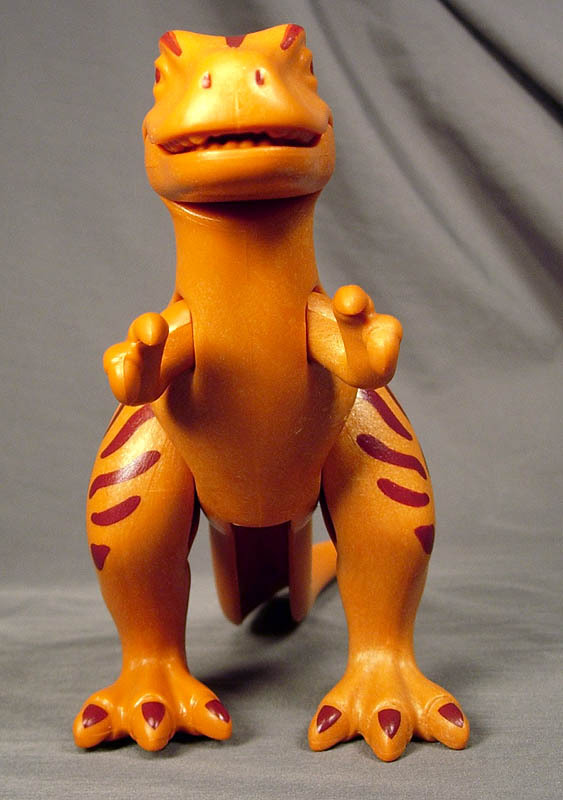 Aside from being a fairly sturdy dinosaur design which seems like it would do well in the sandbox or other rough environments, the lizard can hold things in his hand and can open his jaw. This adds to the fun of the toy, as it's one of very few dinosaurs that I know of that has the ability to chase down a homeless man with a chainsaw. 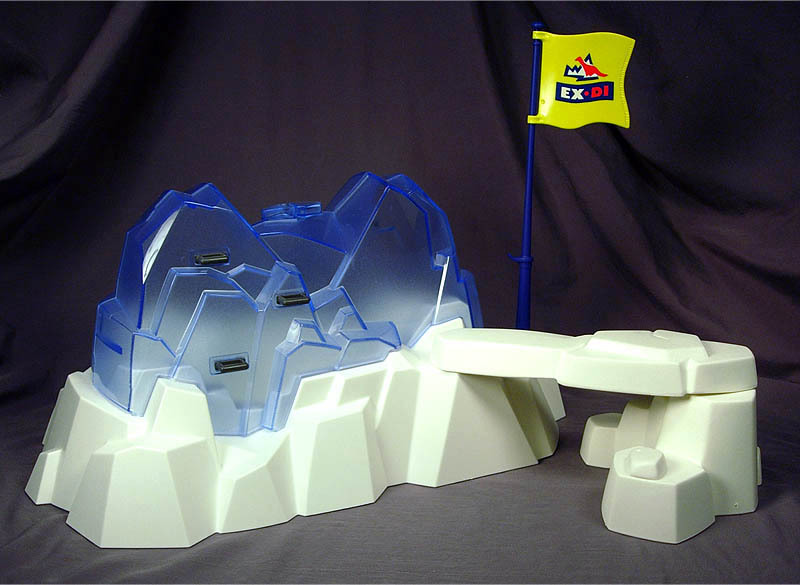 Using the popular (and still in use) "Rockies" construction, this environment includes a few rocky pieces which connect together. There's an added small rock-like piece which fills one of the holes and two big ice pieces which fit together to enclose the dinosaur. What's more, there's also a flag to let you know that this has been claimed in the name of EX-DI, which sounds more like a Final Fantasy villain than a scientific pursuit. But hey, we're not German toy engineers, so who are we to judge? 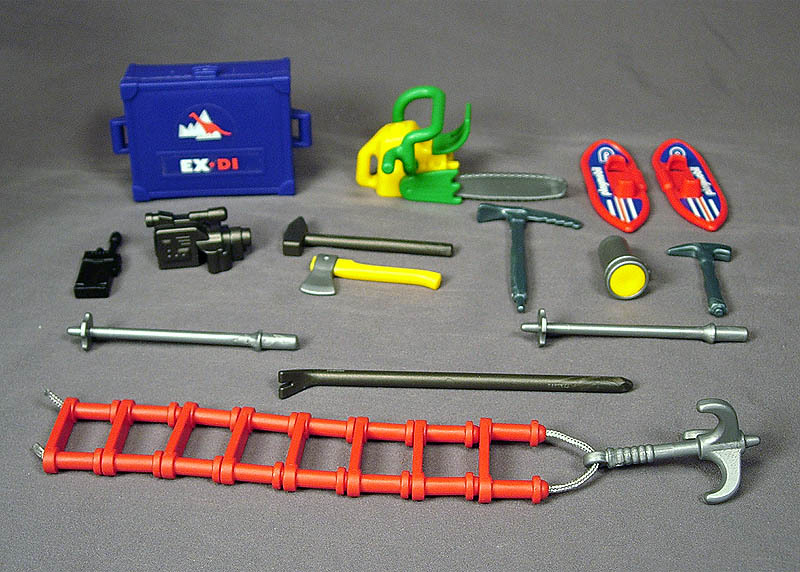 The big pieces are unique to this set, but the smaller ones have been used elsewhere in different colors over the years. They all fit together nicely and quite snug, so they're not going to fall to pieces if you look at them funny. 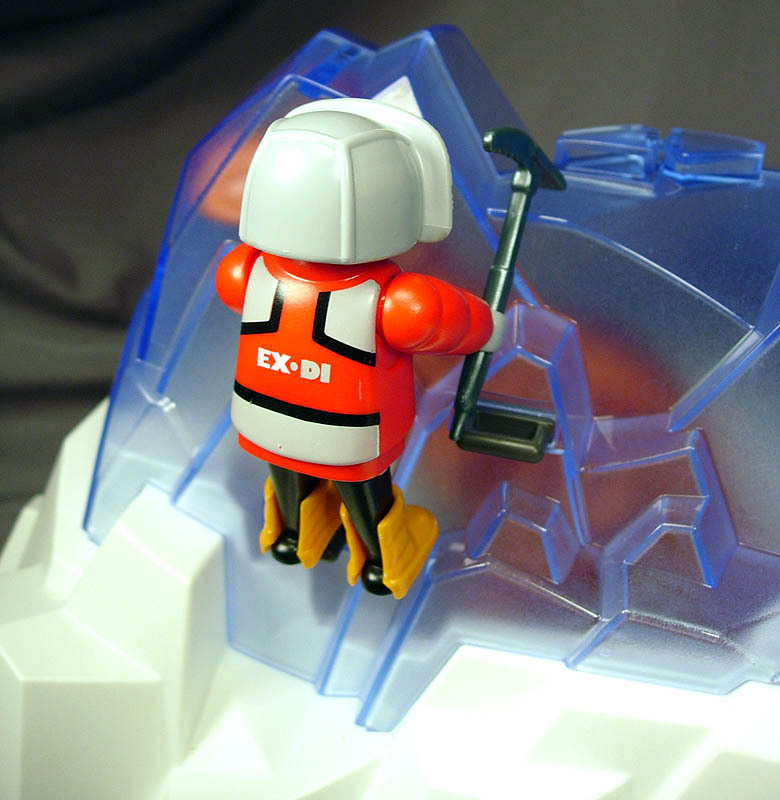 The large sheet of ice has some black grips which snap to its sides, allowing your figures to climb the clear blue structure. 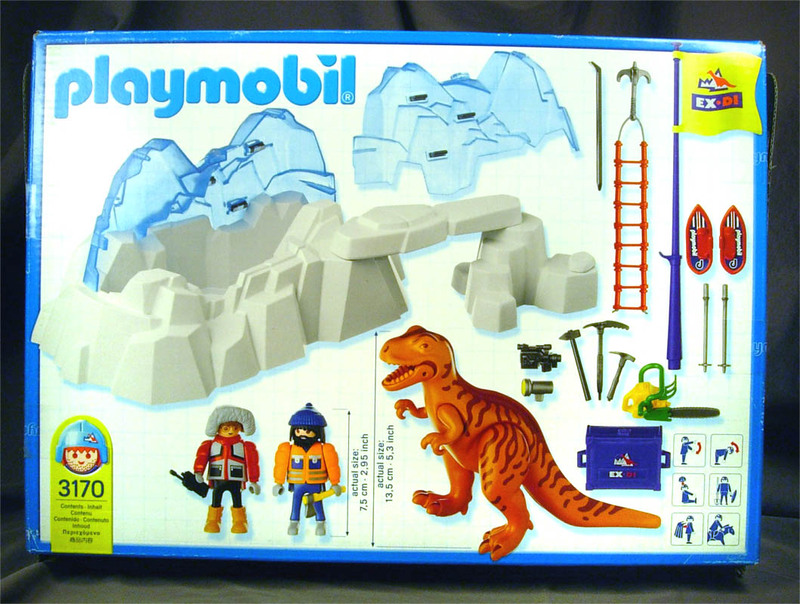 So yeah, with this set you can get your very own dinosaur, frozen in Carbonite. 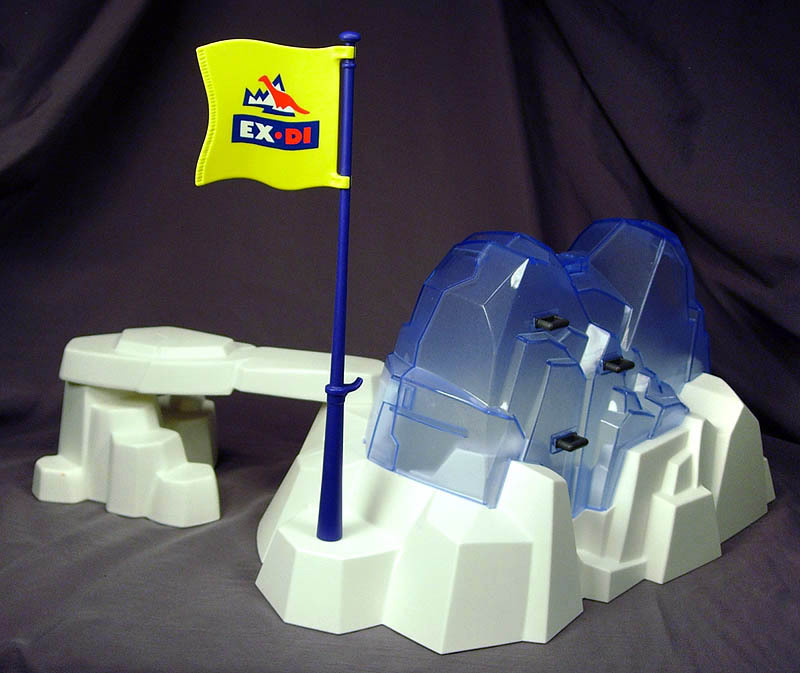 With the rocky pieces, you can actually connect this to other sets in the collection or other "Rockies" pieces, allowing some level of expansion to the set. 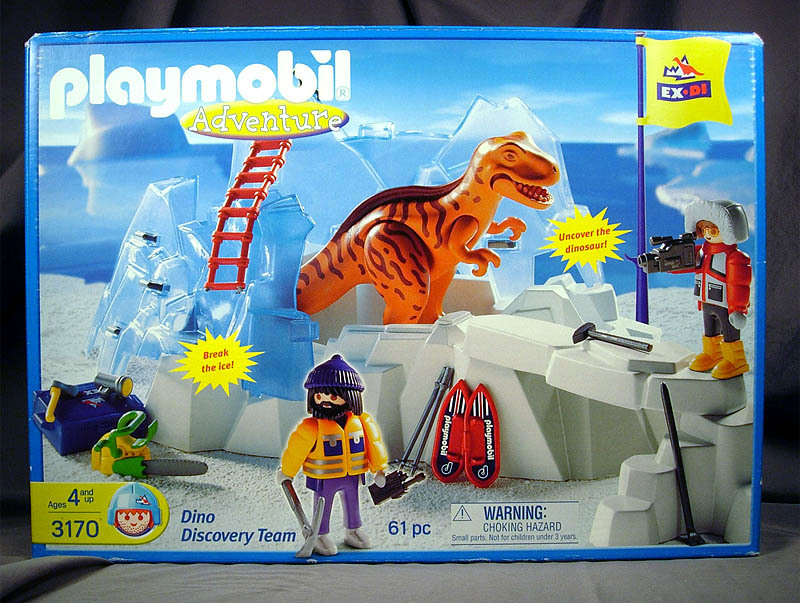 The dinosaur fits snugly inside the ice block, the ladder-on-a-hook can latch on to the ice, and you get a little bridge thing for some reason. The excess white pieces seem like overkill, but they're probably there just to remind you there are other, larger sets to buy. So it's like a constant upsell right there on the toy. 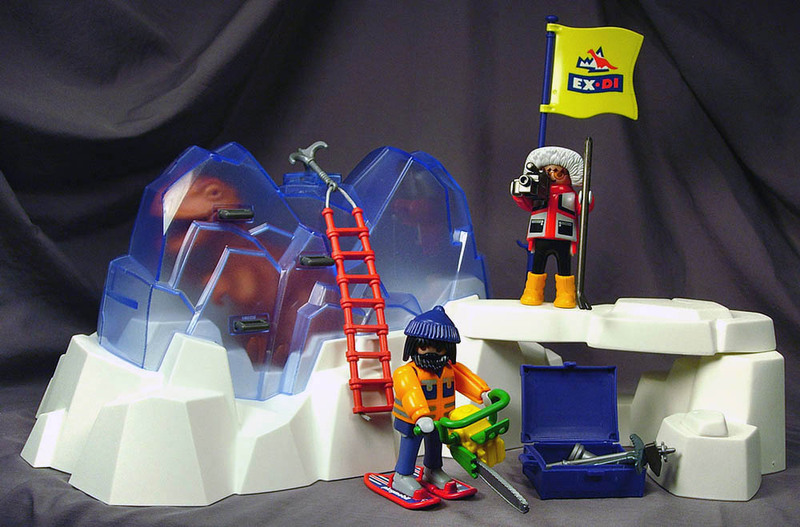 It's a nice option to have, but there really isn't a whole heck of a lot you can do with those added snow pieces other than have the figures stand on them and videotape. 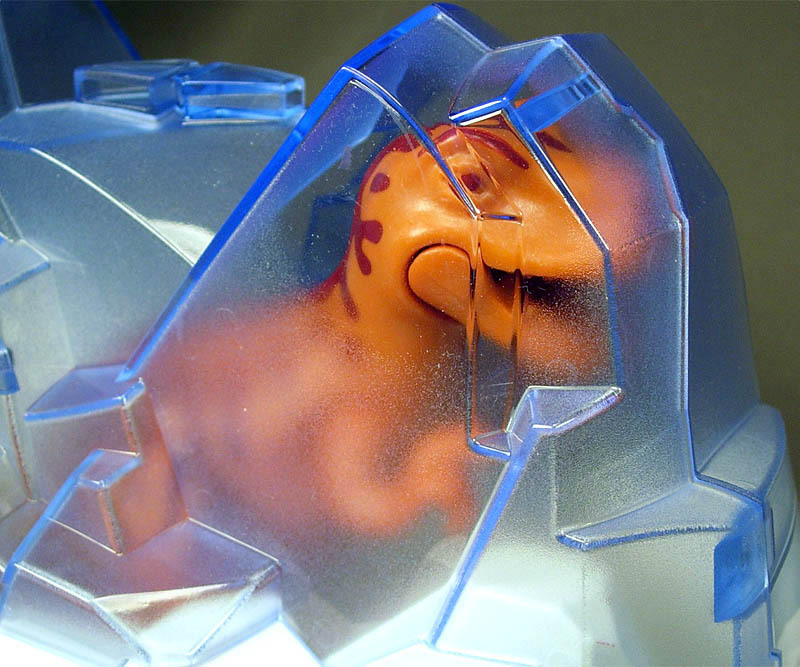 Because you know nothing is more thrilling than getting shocking video footage of a dinosaur that's frozen in ice. While the set has a major environment, a large animal, and two people, it just wouldn't be complete without an array of accessories. The great thing about the accessories is that the bulk of them are things you'll forbid your kids from touching, which of course means they're going to be tons of fun for everybody. Set 3170 comes in a two unique box designs. The one presented here is the one used for US mass retailers, which loosely translates to Toys "R" Us and Target stores in the USA and, eventually, they tend to trickle down to T.J. Maxx, Marshall's, and Ross stores. (Yes, the ones that sell closeout clothes. They're the end of the US toy digestive tract.) For the European box, check out Collectobil as they have a great shot of the non-US packaging. The most notable thing about this box, as well as several other US mass market sets, is that it has big bursts that call out the toys' actions. 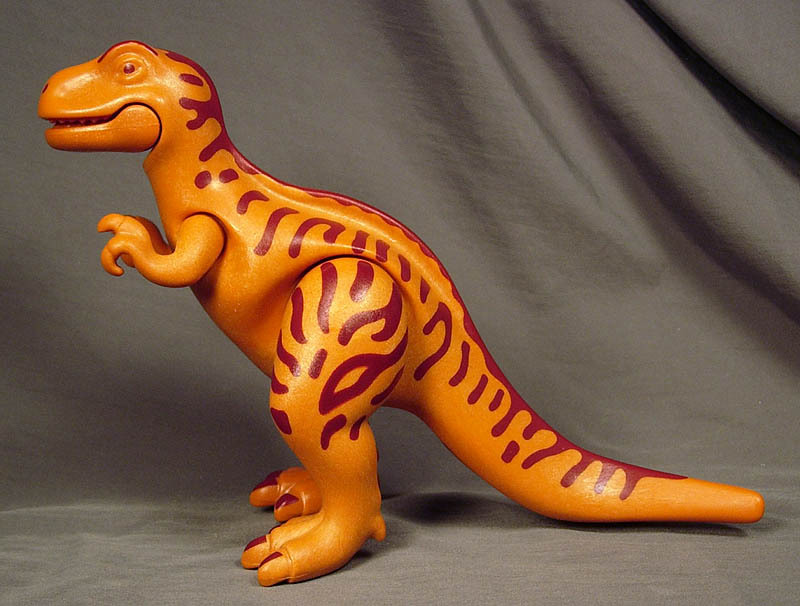 Now you too can "Uncover the dinosaur!" and "Break the ice!" It's worth noting that the ice isn't so much broken as it is separated, and since it latches together quite well, it's not really designed to be pried apart by any tools the figures carry. Maybe next time? Reviewed on February 5, 2008.